Nick B. and apprentice Alex were prompt, curtious, and thorough. Courteous, professional and accommodating. Joe was helpful with advice for added safety for our home. He is to be commended for his excellent customer service. Anthony was great. He checked all the sensors and was very efficient and knowledgeable. Zach was knowledgeable and did a commendable job. He is an awesome employee. Joel came to install two security cameras and fix our doorbell camera. He went above and beyond, working in the rain and climbing through the attic to get the cameras where we wanted them. He even helped me get them connected to our home wired in hub so that we can add more cameras when needed. Nice guy, respected our home, was patient when I screwed up in the app. I think any customer will be happy to have him as the tech who rings the bell. Good Service, good technician. Well done! Joe was thorough and quick. He checked each unit, changed the batteries in all our units and explained how to keep our security system up and running even if we were to lose power. I highly recommend Safe Touch! Joe E. was amazing, fast, honest and very helpful. Joe handled the job with complete professionalism, he is a true team member and valuable asset to the company of Safetouch. The Technician, Joe E, arrived early in the time window. He was very knowledgeable, professional, and I was completely satisfied with his service! Joe E. was very professional and exceedingly knowledgeable. He diagnosed the problem immediately and proceeded to resolve it. He provided outstanding service. I highly recommend him and Safe Touch! 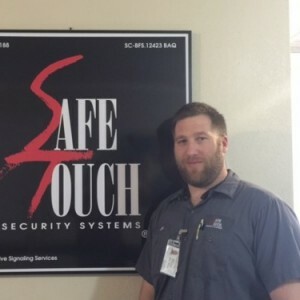 Our Safetouch Security technician Joe E was very helpful. He fixed one problem quickly but the second problem was puzzling. Joe kept searching until he found the solution and now all is working perfectly. Joe E from SafeTouch repaired my trouble and answered all my questions. Joe was very professional and went way above and beyond to make sure every part of our system was working correctly. He kept going until it was. He patiently answered all my questions and concerns. He was great with my dogs when they thought he needed "help". I hope he is my technician the next time I need a service call. Thanks Joe! Love SafeTouch Security !! I have used this security system in my business for 10 years. *** * is the tech that I have gotten the last 2 times for routine stuff and he is nice, quick and professional. Technician came to the house, recognized and fixed the problem with the alarm system including some older problems as well. System is working normally now. *** was on time, listened to my issue and resolved the problem, which I had caused. Didn't make feel guilty about my mistake. Went beyond my request and did additional service that was needed. Way to Go ***! Showed up on time, corrected the issue. Afterwards took the time to correct an annoying intermittent door magnetic producing occasional intermittent alarms. Recently we had some changes to our ISP and cleaning up of wiring in the house for the network. This event detected our security system was offline as that wire from original installation was not labeled and thus unplugged from the switch. When we connected it, the office concluded the speaker was not working in the house so Joe (technician) was dispatched to our house to fix. He called ~ 10 mins into the beginning of the appointment window to notify me of his pending arrival. Was polite and knowledgeable. He troubleshot the issue in ~ 30 minutes and make the corrections. Apparently, one of the previous techs had somehow shut off the speaker in the alarm system control panel that we can't access but the technician can. Anyways, I had Joe walk me through how to reset my master password and he provided me some documentation on how to do some functions that we didn't get from the original install. Hope that we can have Joe take care of us any time we have any issues vs that last guy we had who didn't label the wires and shut off our speaker w/o us knowing it. Lessons learned: 1. Request Joe E. 2. Do the monthly test live tripping the system to talk through the speaker vs calling the office ahead of the tripping and talking to them over the phone. This would have detected the speaker was offline a few months earlier. Nick was very polite and prompt. He took care of my problem within 45 min. Joe E was very professional and courteous, he arrived on time and was very attentive to my problem, he was able to rectify the issue and offered me some tips on keeping my system functioning effectively.